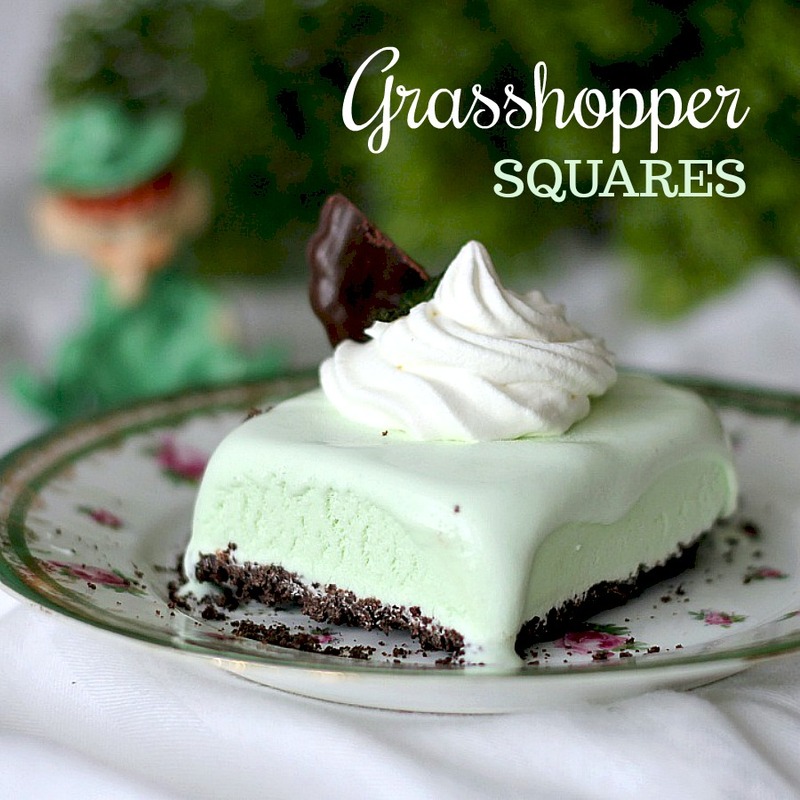 Frozen, minty Grasshopper Dessert Squares are the perfect St Patrick’s day treat or any time you want an easy, no-bake dessert. Crust is made using fudge mint cookies and then filed with ice cream and topped with a dollop of whipped cream. Make ahead and freeze and it is ready whenever you want. Place ice cream in fridge for 20 minutes to soften. Chill a bowl in fridge at the same time. Place cooled crust in freezer. Scoop ice cream into chilled bowl. Stir until softened and blended; gently fold in 2 cups of whipped topping, peppermint extract and food coloring. Spread ice cream mixture evenly over cold crust. Cover with aluminum foil; freeze 6 hours or overnight. I love all your dessert!! Congratulations! I love mint! Your pictures are quite stunning. Look like a very refreshing dessert! thanks for the recipe, I'll be trying. My mint is already popping out in the garden. Thanks for sharing your creative inspiration at Sunday's Best. Oh my, what a STUNNING photo! Great picture. This looks absolutely delicious. Yum! This looks wonderful! I'm a new follower & would love to have you follow me back & link up to Sunday Round Up! oh yum, they look so cute too. This looks dreamy!…Perfect for St. Patrick's Day. I hope your St. Pat's weekend is great! https://kitchenfunwithmy3sons.blogspot.com/2012/03/kitchen-fun-and-crafty-friday-link_15.html We have also included a Sugarlicious giveaway! Please pass the dessert! Thank you for sharing your recipe at Potpourri Friday! Your dessert looks fabulous and perfect for a party…or any time. Love your photos, too. This is such a pretty dessert and a great picture of it, too. I love chocolate and mint and have lots of thin mints to use. I will have to try this for St. Patty's Day! Mint/Chocolate anything is wonderful in my eyes. But this simple dessert would be welcome year-round! 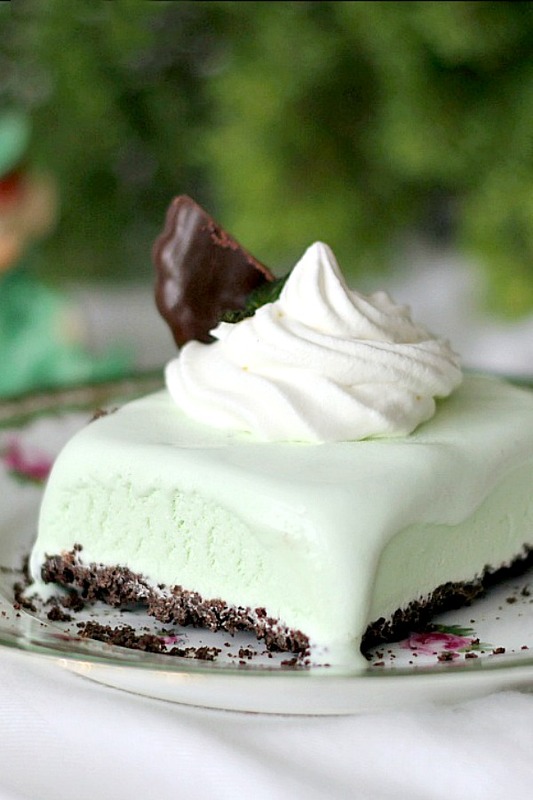 What a great idea for a St. Paddy's Day dessert. Wow I LOVE mint ice cream. This looks fantastic! I must recreate! perfect for St Patricks day….thank you! Oh my goodness this sounds to die for! I hope you'll add it to my St. Patty's Day Project Parade. Yum, yum:) I really should try making these! Looks magically delicious! Thanks so much for joining in the blog crawl with this tasty treat! scrumptious looking dessert! I may have to try this soon! Thanks for your comment on my St. Patrick's day tablescape. come link up to my centerpiece wednesday and share your yummy recipe. Ummm, this looks to die for!!! Thanks for sharing! I wish I could eat it as it looks super delicious! Oh, this looks delicious! So light and refeshing with the mint, and you can never go wrong with chocolate! Just perfect for St. Patrick's Day. Thanks so much for sharing with us at WIW. That looks delicious! I forgot St. Patrick's day is coming. Too bad we do not have mint cookies over here, otherwise I would make this gourgeous dessert. Yummo! Not very fattening, either. I'm always struggling to lose some #. I'm bookmarking this one, for sure. Oh, THANK YOU. I always make a mint chocolate pie for dessert during the month of March. But I've found that cutting it into pie-shaped pieces can be a hassle. I'm going to make squares like yours! Now, why didn't I think of that before! It's so obvious. I'm going to have to get another box of Girl Scout mint cookies too. Yummy L! I think this looks and sounds good and refreshing. Thanks so much. Perfect dessert for my family on this St. Patrick's day. Thank you! This looks Amazing! I love anything mint and chocolate! This looks so wonderfully refreshing and beautiful! I think color adds so much in a dessert's appeal, and this looks amazing! Your photography is beautiful! Yum! My husband would love this. He likes anything chocolate mint. This dessert is 2D4, lmty. I love it! This looks so good and in summer it would be a real fav. This would be a favorite dessert for me! I love mint. Pretty photos, too. That is so pretty–and I bet tastes great too! This dessert is something I would love. I love mint!!! Enjoyed all the pictures you shared in the previous post. Glad your daughter is doing better! Enjoy!